Pocket Manual of Homoeopathic Materia Medica and Repertory is one of the most authoratative books on homeopathy ever published. The book contains well known verified characteristic symptoms of all our medicines besides other less important symptoms aiding the selection of the curative remedy. In its present compact form it contains the maximum number of reliable Materia Medica facts in the minimum space. Categories: Health, Health and Medicine, Homoeopathy, Mind, Body, Spirit. Tags: homeopathy, 9788131901281, alternative medicine, alternative therapy, complementary medicine, complementary therapy, health, homeopathic medicine, homoeopathic medicine, homoeopathy. 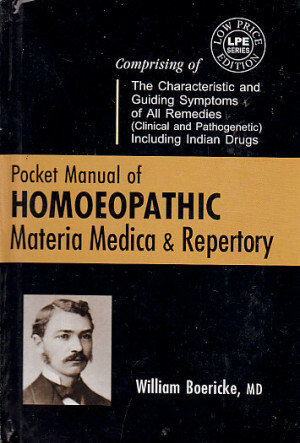 Pocket Manual of Homeopathic Materia Medica and Repertory is probably one of the most popular books on homeopathy worldwide. It is one of the most comprehensive yet concise collections of verified Materia Medica facts and clinical suggestions available. William Boerick, born on October 25, 1849, graduated from Philadelphia Medical College in 1876 and Hahnemannian Medical College in 1880. In San Fraqncisco, he practiced homeopathy for over 50 years. He was a member of faculty of Hahnemannian Medical College and author of A Compend of the Principals of Homoeopathy, Boericke’s Materia Medica and translator to the sixth edition of Hahnemann’s Organon.